Leveling severe criticism of what he called the College administration's lack of "intellectual leadership," veteran music professor Jon Appleton will leave the College for a full-time position at Stanford University next year. Appleton, currently the Arthur R. Virgin professor of music, said the College administration has failed to curb grade inflation, reduce class sizes and stay on the cutting edge. "I've been teaching here 38 years, and I just felt that the administration at Stanford was much more supportive of the kind of work I do than the current dean of faculty," Appleton said. Appleton will teach at Stanford in the spring and return to Hanover next fall to teach his last two Dartmouth music courses. The following spring he will go back to Stanford, where he will teach a seminar about technology's influence on music and work with Stanford's Center for Computer Research in Music and Acoustics. Center Director Chris Chafe said that Appleton is a pioneer in the electroacoustic music field. "He's one of the originals -- he's been vetting algorithms and hardware for doing electronic music since back when it was really, really hard and very unique," Chafe said. Appleton, who has won Guggenheim, Fulbright and National Endowment for the Arts fellowships, created the College's graduate program in electroacoustic music 15 years ago. The interdisciplinary program enrolls up to six graduate students. Appleton also raised Dartmouth's profile as a technologically advanced institution in the late 1970s when he co-invented the Synclavier, which is regarded as the first self-contained digital music synthesizer. Until about three years ago, Appleton had expected to finish his career on the Dartmouth faculty, which he joined in 1967. But in recent years, Appleton said, he has been disheartened by what he called an "exodus of people who want to see a vigorous intellectual climate here," including former deans of the faculty Jamshed Bharucha, now provost of Tufts University, and Michael Gazzaniga, who will move to the University of California at Santa Barbara later this year. Appleton also named former computing services head Larry Levine, who left over the summer, and former Hood Museum Director Derrick Cartwright, who left in 2004, as examples of imaginative community members the College has recently lost. 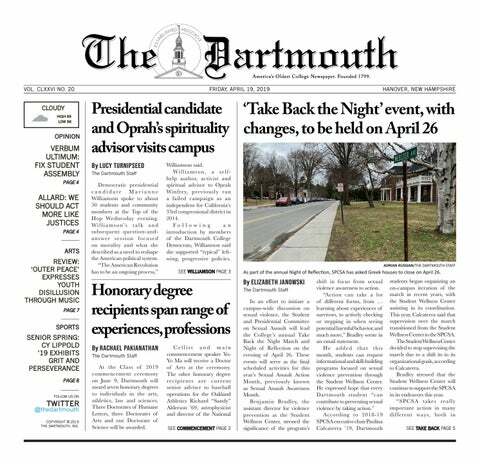 "Dartmouth is the place I've devoted my life to, so it's very sad to see this kind of decline in the intellectual strength of the institution," Appleton said. "I feel like a traitor." At the same time, Appleton said, the intellectual caliber of the student body has increased. "I love the students," Appleton said. "I think the students have gotten better and better. And contrary to what some people think, I think [Dean of Admissions] Karl Furstenberg has done a great job. The students are smarter, more interesting, more motivated." Dean of the Faculty Carol Folt said Dartmouth works hard to draw and retain faculty members who are leaders in their fields by offering competitive compensation packages and creating endowed chairs. She added that Appleton may not be aware of efforts in other departments to attract professors and innovate. Folt said Appleton's graduate program is a good example of the type of technologically advanced work that attracts ambitious faculty and is encouraged by the administration. She said that she has supported the program by growing its operating budget more than any other program's and ensuring that the graduate students get health benefits. "It's a small program, but it is a highly innovative one," Folt said. Folt said Appleton did not inform her of his plans to leave. "He's been an excellent, innovative composer, and he brought all that energy to Dartmouth for many years," Folt said. Appleton said that he never felt dissatisfied by any previous dean of the faculty or the four college presidents he worked under before current College President James Wright. "Dartmouth has a long history," Appleton said. "This is a little bump in the long history. There will be future presidents and deans who provide a great deal of imagination and leadership to the academic side of this institution. I have no question that that will happen." The 66-year-old professor said he continues to be active in his field and loves teaching. "In the years that I have left, I want to be at a place where intellectual achievement is prized," he said.